Reflecting on all of the fun, madness, and lessons we learned from our productions. I recently attended the Hollywood Walk of Fame star ceremony honoring Will Ferrell. The chairman of the the Walk of Fame always lists the many accomplishments of each recipient before bringing them on stage. Of course, the crowd went wild when many of Will Ferrell's greatest hits were mentioned, including Anchorman, Elf, and Saturday Night Live. When my favorite Will Ferrell film was announced, however, a much less enthused applause was heard. Stranger Than Fiction was not your typical Will Ferrell film. It's about a man who finds himself able to hear a narration of his life, which reveals that his death was imminent. Not only was the story and the presentation clever and engaging, Will Ferrell showed us an emotional side of him that was unexpected. There were no gross out gags, or wacky slapstick. It was all heart. Granted, I've never been a big fan of over-the-top, mindless comedies. Films such as Dumb and Dumber, Billy Madison, and Anchorman may have some amusing moments, but I always find them a bit pointless in the end. Don't get me wrong, the stars of these films are amazing at what they do, but they have so much more to offer than that. In fact, time and time again, these actors have proven that they are capable of playing roles with much more depth. Jim Carrey, the man of a thousand faces, also has a sad face. His awe-inspiring performances in Eternal Sunshine of the Spotless Mind and The Truman Show were truly memorable. 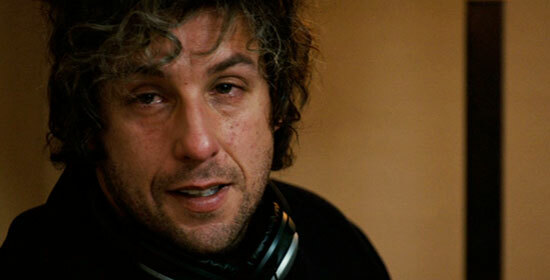 I still recite the line, “In case I don't see ya', good afternoon, good evening, and good night!” Adam Sandler, who's been labeled as a one trick pony in recent years, showed some magic in Reign Over Me. That moment when he finally experiences emotional catharsis and kisses his mother-in-law on the cheek still gives me goosebumps. Steve Carrell, stepped out of the shadows of his clownish TV persona, and into a much darker, suicidal place in Little Miss Sunshine. He didn't need many words, his deep facial expressions told more story than any dialogue could provide. Will Smith isn't really a full on comedy actor, even though he did start his career as the Fresh-Prince. One of my favorite scenes of his was in The Pursuit of Happyness when homeless Will held tightly onto his son while blocking the public bathroom entrance with his leg, all the while holding back tears... while I couldn't hold back mine. Of course, there are many other films that the aforementioned actors had more serious roles in, but the movies I listed are some of my favorites. Don't get me wrong. I still love comedies, but I do usually prefer the more clever types such as the satirical elements in Austin Powers, the seamless interwoven relationships in Love Actually, and the exaggerated family dynamics in This is Where I Leave You. The mindless comedy subgenre is absolutely necessary in providing entertainment and escape for viewers. However, when comedy actors can step out of their shell, and deliver remarkable, unpredictable performances in dramatic characters, that's when they truly inspire me.